Murfreesboro's Meme Jackson on defense against Oregon State’s Kat Tudor during the Lady Vol’s loss against the Beavers in the NCAA Regionals. The Tennessee women’s basketball team developed a tight chemistry during the offseason that head coach Holly Warlick immediately sensed once practices began. The Lady Vols are hoping the strong bond can guide them through a season of change that includes departed stars, a younger core and new leaders emerging. Led by sophomores Rennia Davis and Evina Westbrook, UT plays its lone exhibition game on Nov. 5 against Carson-Newman at 6 p.m. CST. The Lady Vols open the regular season on Nov. 11 against Presbyterian at 1 CST p.m. Both games are at Thompson-Boling Arena. Tennessee, picked to finish third in the SEC preseason poll behind Mississippi State and South Carolina, returns three starters and six total letter winners from a team that went 25-8 overall last season and finished tied for fourth in the SEC (11-5). The Lady Vols lost to Oregon State in the second round of the NCAA tournament last season, marking the first NCAA tournament home loss in program history. Seniors Mercedes Russell and Jaime Nared graduated and entered the WNBA, paving the way for new leaders to emerge. The Lady Vols welcome the nation’s fourth-ranked freshman class, consisting of forward Mimi Collins, wing Rae Burrell and guards Zaay Green and Jazmine Massengill. Graduate transfer Lou Brown was expected to play a big role for the Lady Vols, but the 6-foot-3 Aussie tore her ACL in practice two weeks ago. UT plans to petition for an extra year of eligibility for Brown while she still contributes this season as a leader and calming presence from the bench. Anastasia Hayes, a sophomore guard from Murfreesboro, was dismissed from the team last month following a violation of team rules. Hayes announced last weekend she’ll be playing for Middle Tennessee State University. In the absence of Russell and Nared, Davis will be at the center of most scouting reports. As a freshman starter, the 6-foot-2 wing averaged 12 points and 7.6 rebounds. Davis tallied nine double-doubles and was an All-SEC Freshman Team selection. Russell’s void in the post will largely be filled “by committee” this season, according to Warlick, with a rotation of post players shouldering the load. Taking advantage of their speed and depth at multiple spots, the Lady Vols want to play at a higher pace on both ends of the court. 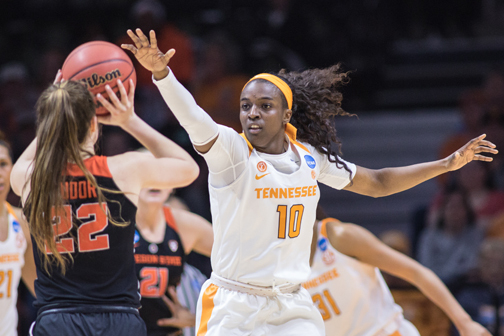 The Lady Vols are placing an emphasis on taking better care of the ball. During the offseason, Warlick watched and charted all 542 turnovers the team committed last season. Aggressive turnovers can be expected, but unforced turnovers stemming from bad decisions or lack of concentration won’t be tolerated. Westbrook went through some freshman struggles last season while adjusting to the college game. But the Oregon native has been the team’s most improved player entering this season. The Lady Vols are taking a more hands-on approach overall this season. Past research involving NBA teams indicates that teams giving the most high-fives, fist-bumps, hugs and pats on the back tend to be more successful. “We have been really working on that in practice. The coaches really make sure and really nail into our head that great teams really touch each other,” Westbrook says. Although they know when to be serious, the Lady Vols try to have as much fun as possible. Having learned from others her first three years, Meme Jackson is embracing her role as a senior leader this season. The Murfreesboro native is one of only two Lady Vols with a car and considers it her duty to be a chauffeur. The Lady Vols were considering going to a Haunted House before Halloween arrived. They just needed to figure out how Brown could make it through with her injured knee. There was no chance they were leaving her behind.